Well, to be specific, there were vehicles everywhere. The line to get into Six Flags Fiesta Texas was pretty backed up. Horns were blaring because vehicles were trying to cut people off. Yup, it was Spring Break. I didn't realize it was going to be that insane, but it was. It took nearly an hour to get through the gates and park. Luckily we sort of had a plan, so that helped. Here's my advice so you can keep your cool. Or try to, at least. 1. Eat beforehand or bring snacks. You're allowed to bring in outside food. Natalie and I had lunch beforehand, and I'm glad we did, because the lines for the food were insane. Plus, honestly, I've never been impressed with the food there. The last time we ate at Johnny Rocket's, everything was cold, and the Diet Coke tasted weird, which is a huge negative for me. Diet Coke keeps me friendly and I can't have it tasting rancid. 2. Consider getting a Flash Pass. There's a Flash Pass building and you get various options. There's the regular Flash Pass, the Flash Pass Gold, and the Flash Pass Platinum. It basically means you don't have to wait in a regular line. The Flash Pass is basically like the current line, but you just don't have to wait in it. Your device will go off when you can enter the Flash Pass line. With the Gold your time is cut in half, and with the Platinum, it's 90% faster. The amount you pay for a Flash Pass is based on the day you go and yes, you can buy online as well. I paid $130, which yes, is a RIDICULOUS amount. But I wanted to be sure Natalie got on the rides she wanted and I was curious on how it worked. You reserve the ride you want, and it'll tell you the times to return to the ride. With the Platinum pass, Natalie never waited more than 20 minutes. It was only about 5-10 minutes when we first got there, but towards the end of the day, it got longer. Would I pay $130 again? Probably not. But it DID work, and Natalie got to ride the roller coasters multiple times. Without the Platinum pass, I doubt she would have been able to do that because some wait times were 2 hours. 3. Get to the park EARLY. Yeah, we didn't do this. We should have. Hence why I had to pay a silly price for a Flash Pass. We got to the park about two hours after it opened, and tons of people were there. Try to get there right when it opens and race to the rides you want to get on. 4. Take a photo of where you parked. Seriously, the lot will fill up on busy days. I'm glad I did this, because I totally forgot where we parked after a long day. Luckily I just checked my phone and figured out where to go. Phew. 5. If you get dehydrated, water is free. Although the lines are crazy, so try to bring water with you. Or use the water fountains. 6. If you're a wimp and refuse to go on the rides, make sure your child knows where you'll be when they get off. I would normally wait at the exit of each ride for Natalie. Or if it wasn't a great place to wait, I showed her exactly where I'd be. 7. If there's a character line and you really want to meet said character, wait in it. 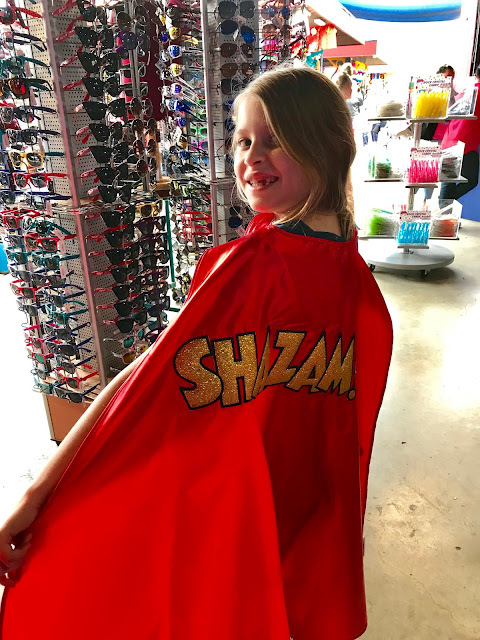 Six Flags doesn't really have specific times when characters come out. The map would just say something like "characters will be out between 11-6." Natalie wanted to see Wonder Woman, and we saw some people in line. Wonder Woman had gone for a break and the workers had told the people in line that it would be about 30 minutes. They said they had been waiting nearly 2 hours. However, we lucked out, because when we got in line, we waited about 20 minutes and then Wonder Woman appeared! This can be easier said than done when there are tons of people cutting in front of you without saying excuse me. Take breaks. Bring your own chocolate so you can eat that when you feel yourself losing your cool. 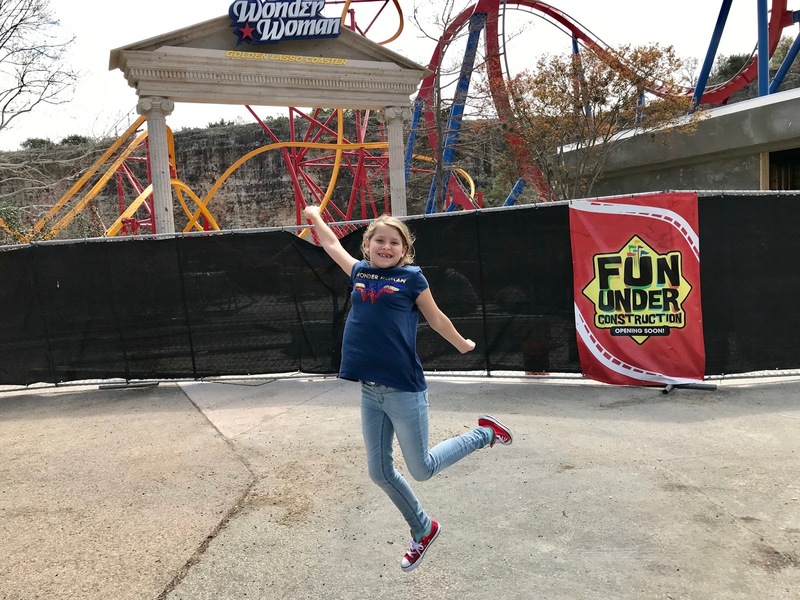 We ended up having a fun time at Six Flags. True, I didn't go on any rides, but I always enjoy people watching. Plus I had a book with me, so I would read when Natalie was in line. There are also shows, but we didn't go to any on that day. Natalie had a blast, which is the point. We'll probably go back for the Mardi Gras celebration. Maybe it'll be an off peak time so the Flash Passes aren't as expensive. Fingers crossed. Or we'll get there early so she can get on her favorite rides. Oh, and the new Wonder Woman coaster is set to open soon! So we'll be sure to go back for that. 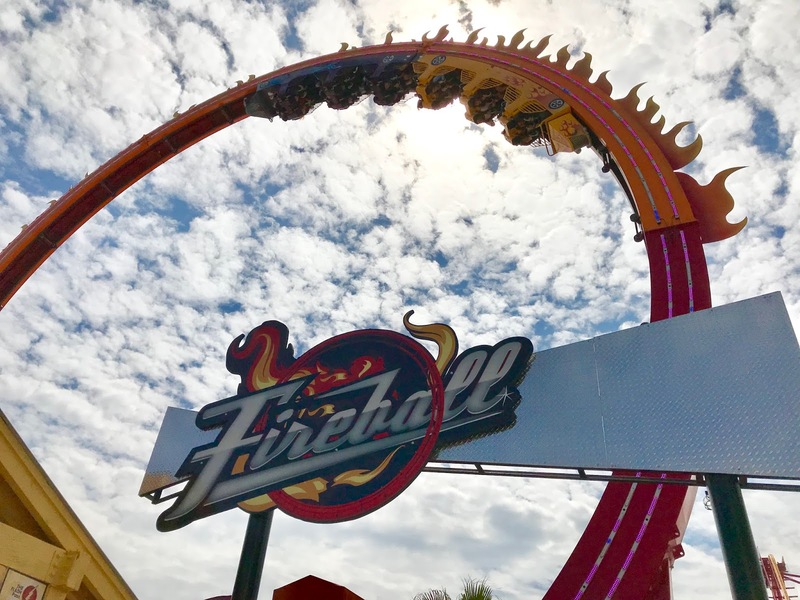 How do you manage theme parks during busy times? I once went to Disney World on July 4th. I feel your pain! These are great tips!!!! When we went to Universal Studios a few years ago we paid for the front of the line passes and it was worth every single penny haha. 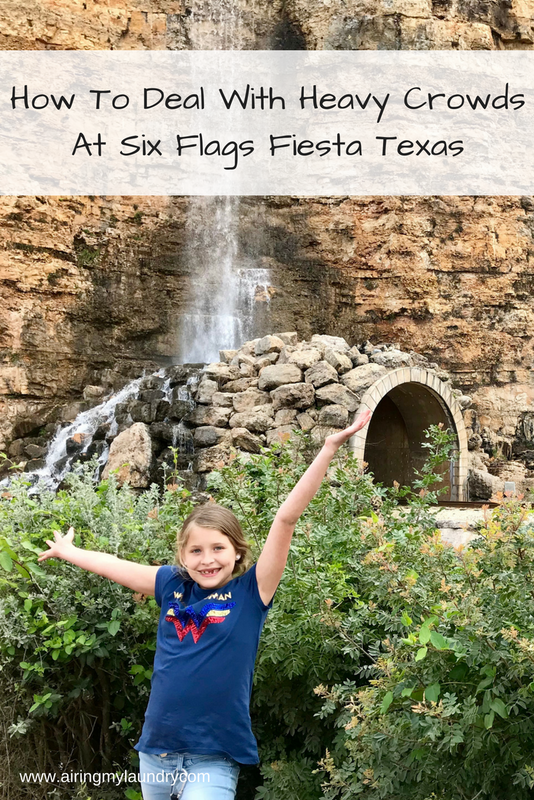 I've never been to Six Flags in Texas but have been to the one in St. Louis several times the last two years. I bought Season Passes when they were on sale. I never went during peak times when I was pretty sure everybody and their dog would be there too. One tip I learned is to head towards the back of the park when you first get there. Most people head to the first rides they see, so the back usually has less people in the beginning. Wow! This is such a wonderful place.. I wish I could visit there... Since I already hv the tips on how to deal with heavy crowd.. This place looks so amazing..I too want to visit. The Flash Pass sounds awesome. I wonder if they have this at my Six Flags. It is a great idea because who likes to stand in line? We went to Disney once during spring break - never again! Not only was the park overcrowded, but the traffic was a nightmare. I think the Flash Pass is worth not having to wait for hours in line. I grew up going to Six Flags in Atlanta and we always had the best time. Great tips for visiting any theme park. I like the character line and your right just go stand in line. ou will get there. Great idea about taking a photo of where you park! I should do that at the grocery store. This place looks so amazing..It is a great idea because who likes to stand in line? I am also not a fan of crowds when I go to parks or anywhere really, I always end up having to over plan and just know every step. We love Six Flags over the summer. It is always so much fun. I love the idea of having snacks for all the waiting. You are a great parent to take your child on this trip and be prepared to enjoy it to the fullest. All these parks have large lines so fast pass is the way to go. I love going to Six Flags with the kids. Sometimes the heavy crowds can be challenging to deal with. We usually like to go early so we can beat the crowds. 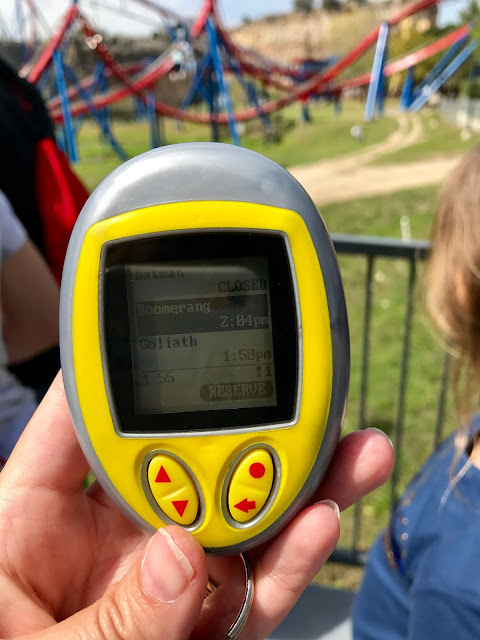 I had no idea that Six Flags had Flash Passes! 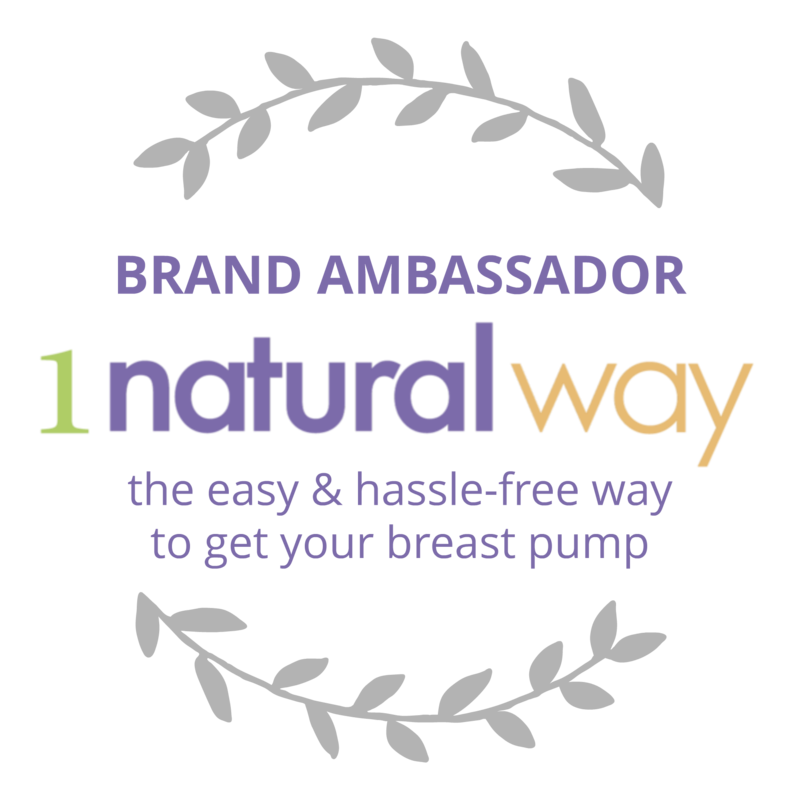 We use something similar at Disney and it is so much easier! I need to check that out when we go to Texas! I haven't gone to an amusement park for quite a while. I definitely need to bring some patience and lots of snacks when I am going to Disney this month. Omg. You go on that wonder woman one? I’m too afraid. As you know, we only ever go to Disney World during slow times, or at least slow for them. We have a six flags here and we get season passes and we always include parking. And definitely showing up early! This are wonderful tips! I would love to visit the Texas location one day. The flash passes sound like a wonderful idea. These are all such wonderful and great tips. I bet Natalie had a great time and was happy she was able to ride so many times. Glad to know you guys had so much fun despite the huge crowd! Love the tips that you shared. 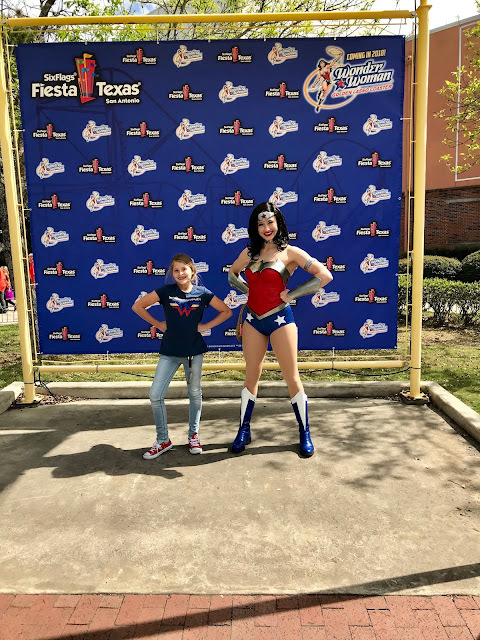 It's awesome that Natalie got the chance to meet Wonder Woman! 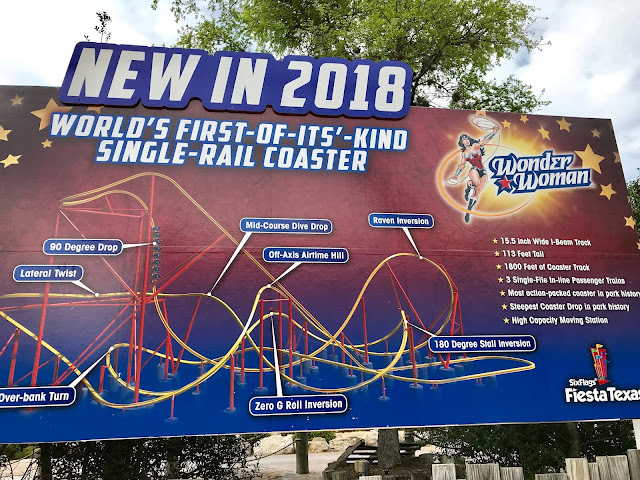 The new Wonder Woman coaster looks absolutely bonkers! I would so live to ride that monster! Omg we love six flags! It’s the first theme park my husband and I ever went to! My family had come down from New York and let us use their guest passes, it was amazing. It's nice to get passes that limit the waiting time, it's a little pricey though but I'm glad Natalie was able to enjoy it. I love that she got to meet Wonder Woman! The perfect place to take the kids to especially during Spring break. Love that passes but they're a little expensive. It serves its purpose though. Awesome tips on how to spend the day without being bothered by the crowds! The flash pass is such a clever way to get through the lines in no time. I hate when you have to spent 10-15 minutes in line just to be able to do a 2 minute thing. I am not a fan of riding a roller coaster but I like the idea of having there and see people enjoying the rides. 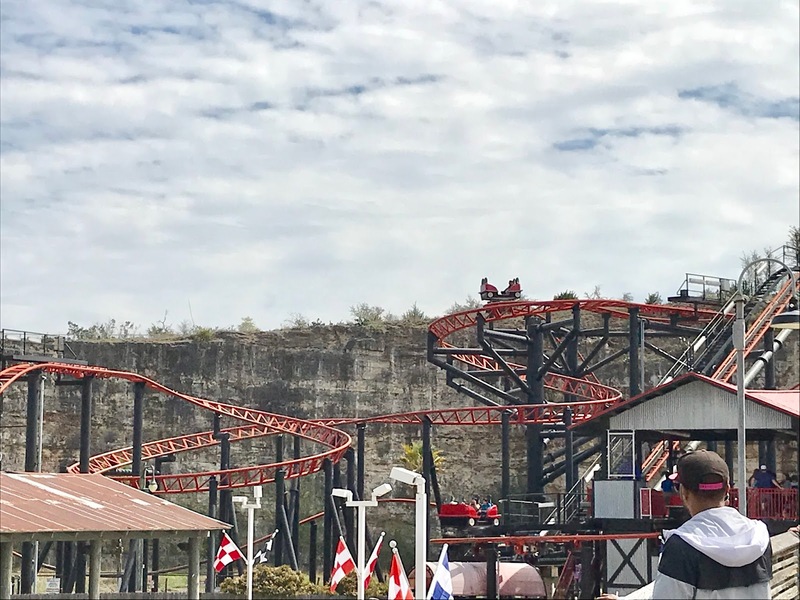 We have same thing like this Dollywood its always crowded there too all year round. We always like to get there on time. The earlier the better, but you're right a Flash Pass does come in handy. I think the flash passes make sense as time is not wasted in queues. Also in such places it is advisable to set up meeting points where the kids can find you. Ugh, I just stay home during Spring Break! lol Every place is going to be so crowded and this pregnant momma isn't having it! lol But it looks like you guys had a blast! 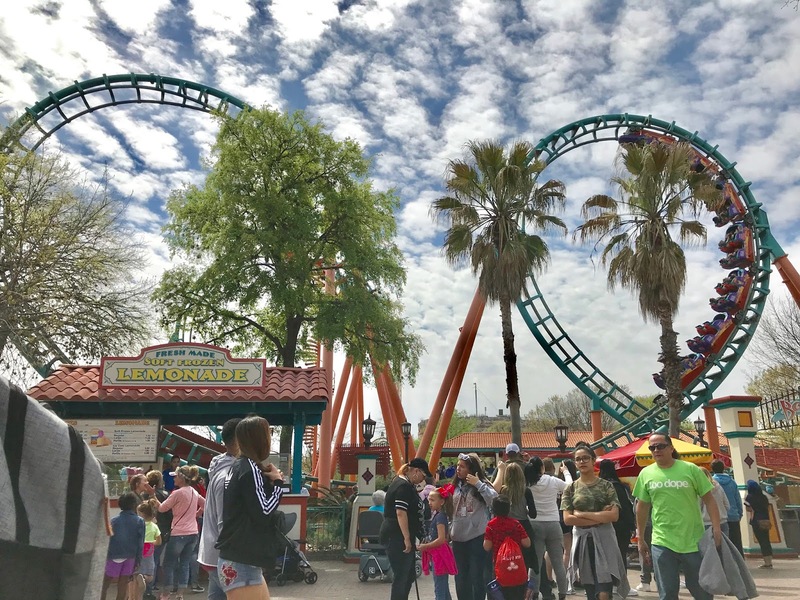 I haven't been to six flags in ages! I absolutely love roller coasters! My favorite. Great tips! A fast pass is always a good idea when you have kids with you and it's great that water is free. 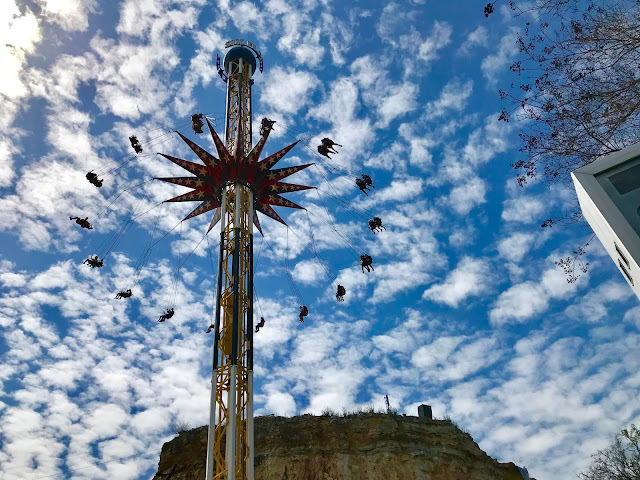 Love that picture of the ride and the cloudy sky. Amazing suggestions. Love the pictures. I'm going to have to follow you on the tips! These are awesome tips! I think we need to be prepare for visiting theme parks with or without kids, coz it will save us time, energy, and costs. I love your pictures and those rides, are OMG am not sure if I can! The flash pass definitely sounds like a lifesaver. I am really not for standing in line for hours, especially as I have a restless little one who'd probably complain the entire time. It's been awhile since I've been to Six Flags, but I'm loving all of your tips! The parks can get overcrowded, but I'm so glad you were able to make it a great time.